The net is the most important tool for proper catch and release of muskies. It is so important to have a good net. Some of the features to look for is: a big strong hoop, a deep bag, a rubber coated bag so the hooks don't get into the rope, and a strong yoke. 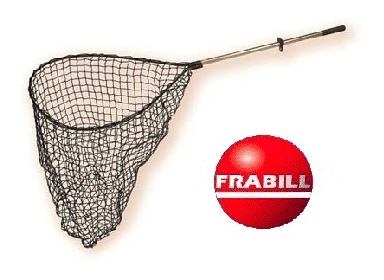 Frabill and Beckman manufacture very high quality nets. Frabill has one added feature with the handle being triangular so it can't rotate making it easier to click into place. Do the fish a favor, once in the net, unhook it and get everything ready while the fish is in the water in the net. Use the net as a in the lake live well. Keep the fish in it's environment as much as possible. A good rule of thumb is not to have a fish out of the water any longer then you can hold your breath. I've observed many people hoist the fish into the boat and unhook it on the bottom of the boat. Then take 20 minutes "reviving" the fish before it can swim off. How good do you think that is for a fish? Here is a little gadget I came up with so I don't have to worry about loosing my mouth spreaders or long needle nose pliers while unhooking a musky. If the fish thrashes I am able to let go of the tools and get my hands out right away! 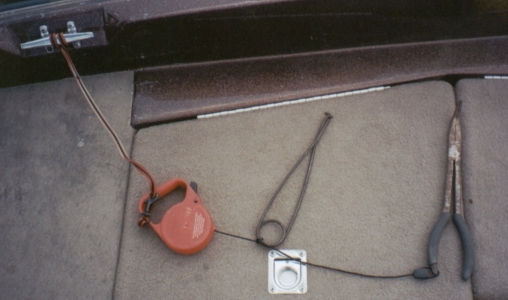 All it is, is a small retractable dog leash which I attach to a boat cleat at the front of the boat. It, also, keeps the tools in an easy to find place all the time. The rope is plenty long enough for me to unhook a fish at the back of my 21 foot Stratos. The needle nose is one with a 45 degree bent nose. The tough part of building this is drilling the hole in the handle of the pliers, which is very hard steel. I accomplished this by drilling it in a drill press with alot of lubricant and a slow spindle speed. Hose clamps or zip ties may work, also. Contact me if you would like me to build you a set or two. 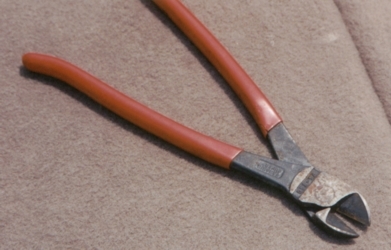 These are the neatest pliers I've found yet! They are available from Mac Tools. Part Number P11SCB. 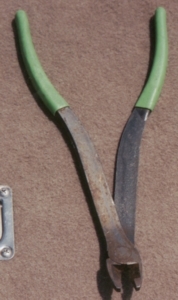 They have a pliers on the very end and a cutter right behind that. Notice how the long handles are flat and not round, to add strength. Here are some more good cutters. These are high leverage cutters available from Knipex. 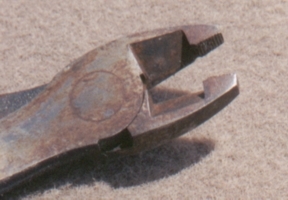 Part Number 74-250, Or Matco Number PDC10. Notice the jaws are flush cut.